Prepare the quinoa. In a medium saucepan, heat oil and garlic over low heat. Add quinoa, stirring, and cook about 1 minute to toast the quinoa. Add broth and lemon zest. Cover and simmer on low heat 15 minutes. Once quinoa is done cooking, stir in lemon juice and mint. 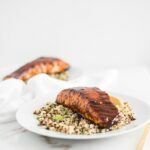 While quinoa cooks, prepare the Alaska salmon. In a small bowl, stir together harissa seasoning, water, olive oil and honey. Rinse Alaska salmon filets and pat dry with a paper towel. Squeeze lemon juice onto salmon. Heat a large nonstick skillet over medium-high heat (medium heat if your stove tends to run very hot like mine). Spray or lightly grease the skillet. Place Alaska salmon filets flesh side down in the skillet and gently press with a spatula. Cook without disturbing 2-3 minutes, then flip. Brush Alaska salmon with harissa sauce. Cook an additional 4-5 minutes, or until skin is crispy and salmon is cooked to your liking in the middle, brushing with more sauce every minute or so. Divide quinoa among 4 plates. Place an Alaska salmon filet on top of each and serve. This recipe can easily be halved for two people. If you’d like to use harissa paste instead of harissa seasoning to make the glaze, omit the oil and stir together 1 tbsp of harissa paste, 1 tbsp water and 1 tbsp honey.